"We have a whole calendar slated with new beers coming out into the market, all of which need to be approved by the federal government," one local craft brewer said. "There's much more to it than just brewing up a new recipe, bottling it up and sending it out to market." ALEXANDRIA, Va. — In Alexandria, Virginia, on Wednesday, business owners, furloughed federal workers and a U.S. senator sat down with a cold beer and tried to solve the world’s problems, while commiserating about the tough times brought on by the partial federal shutdown. 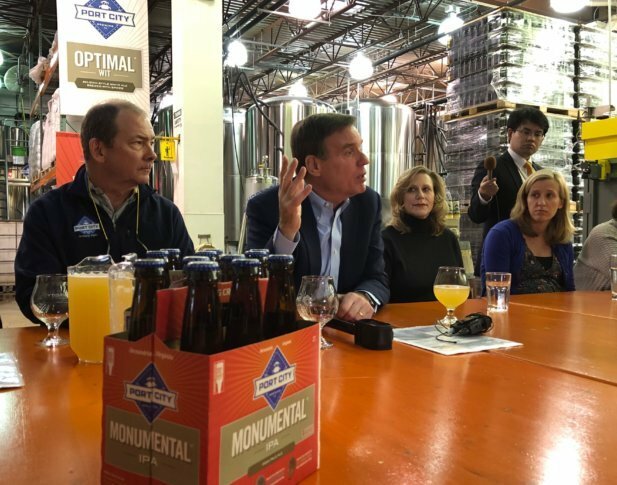 Sen. Mark Warner, D-Va., sponsored the gathering Wednesday at the Port City Brewing Company in Alexandria, Virginia, where founder and CEO Bill Butcher talked about issues shared by craft brewers locally and nationwide. Approval from the Alcohol and Tobacco Tax and Trade Bureau, part of the Department of the Treasury, is needed for everything from labels to ingredients. “We use over 100 tons of Virginia-gown wheat every year. So, it affects our farmers as well; it affects our hops suppliers,” Butcher said. Butcher said another ripple effect of the shutdown included a decrease in sales by as much as 50 percent at his D.C.-area restaurants. Donna Anderson of Sweet Fire Donna’s said sales were also down about 50 percent at her five restaurants. And, she’s had to cut staff. “There is no back pay for us. We won’t be able to make this up,” Anderson said. There were also federal workers around the table Wednesday. They talked about struggling to pay student loans, their parents withdrawing money from retirement accounts to help out, having to pay penalties to get money out of IRAs to live on, and struggling to pay for gas to get to work. “I’m on credit cards paying for gasoline just to get to work. Eventually, there’s not going to be any balance left…and then the credit card bills have to get paid,” said Rachael Abraham, of the Transportation Security Administration. Both Abraham and her spouse were federal workers not getting paid. Sue Shallal and her spouse, who both work at the Environmental Protection Agency, were also surviving with no means of income because of the shutdown. But for Shallal, she wasn’t just concerned for herself. “I’m concerned about future generations and how we’re going to attract the best and brightest to public service,” Shallal said.